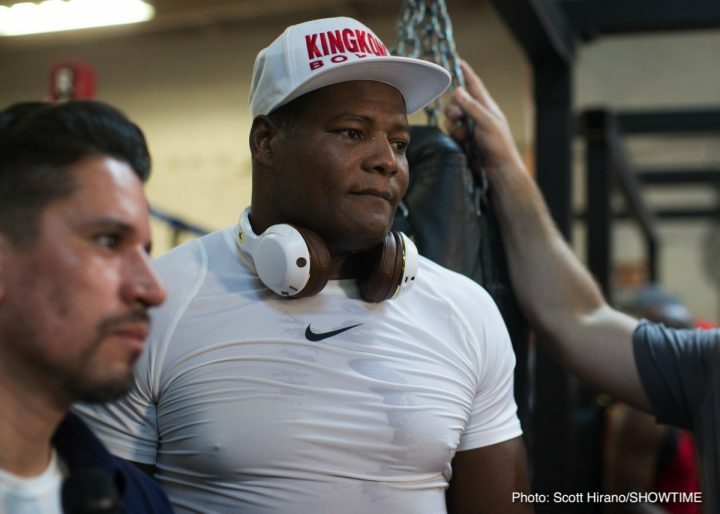 By Scott Gilfoid: Deontay Wilder has once again reiterated that if Dillian ‘The Body Snatcher’ Whyte faces Luis ‘King Kong’ Ortiz and beats him, then he’ll keep his word and give him a world title shot for his WBC heavyweight title. Whyte and Ortiz have been trading challenges in the last two weeks saying that they want to face each other on December 22 in London, England. However, it appears that Whyte, 30, isn’t as serious about the fight as Ortiz is. Whyte and his promoter Eddie Hearn are trying to put together a fight against former world title challenger Dereck Chisora (29-8, 21 KOs) for December 22. That’s the fight that Whyte appear to actually want. Ortiz appears to be a name that Whyte keeps throwing around, possibly to get Chisora to come in at a lower price in the negotiations. I hate to say it but I don’t see Whyte ever facing the likes of Ortiz. The only way I see Whyte facing Ortiz is if he’s dragged into the ring kicking and screaming by Eddie Hearn. Ortiz is too intimidating for the likes of Whyte, and it would end badly for Dillian in my view. One bad 1st round knockout loss for Whyte and he can kiss goodbye forever his rematches with Anthony Joshua. Hearn couldn’t recycle the Joshua-Whyte match-up ever again after that and try and sell it to the British boxing public as fresh goods. The fans would rebel and turn up their noses to a stale fight like Joshua vs. Whyte. Hearn should be giving the fans fresh blood by matching Joshua against guys he’s never fought before instead of trotting out Whyte again after he’s already been knocked out by him in 2015. It would be understandable for Hearn to put together a retread fight between Joshua and Whyte if the fight was competitive, but it wasn’t. Whyte was a punching bag for Joshua from round three until the seventh, which is when it ended when Dillian hit the deck. After all this time, Whyte’s actions speak volumes. He hasn’t shown that he wants a fight against Ortiz OR Wilder. I see Whyte only wanting to fight easy marks, and guys that he can make money fighting in England like Chisora. I’m not sure what Whyte will do when Chisora hangs up his gloves, but that probably won’t happen for another six to ten years. Chisora reminds me of Matt Skelton with the way that he’s just going to hang around well past his prime. That’s good for Whyte, because he can keep fighting him and his boxing fans in the UK will keep buying the fight instead of ignoring him until he faces some talents like Wilder and Ortiz. Whyte could get the fight with Wilder at any time. He just needs to follow the WBC and Deontay’s instruction to take on Ortiz and beat him first. If Whyte showed an inclination to earn the Wilder fight instead of acting as if he has a sense of entitlement like he’s royalty. That’s not how it works in the sport. You’ve got to work your way to world title shots by beating the best, not the worst. Whyte has a good thing going for him though with him signed on with Matchroom Sport, the same promoters that promote Anthony Joshua. Whyte’s promoter Eddie Hearn isn’t bothering to match him against dangerous guys like Ortiz, because his goal is to feed him to Joshua again in 2019 and sell that to the fans on Sky Box Office PPV, even though it’s a retread fight with a predictable outcome. Wilder (40-0, 39 KOs) has been giving Whyte (24-1, 17 KOs) the key to a fight against him by telling him repeatedly to go ahead and face the 6’3” former Cuban amateur star Ortiz (29-1, 25 KOs) and he’ll fight him. Whyte has stubborn and resistant to following Wilder’s instructions, however. Whyte wanted Wilder to just give him a world title fight in a silver platter or have the World Boxing Council make him the mandatory challenger. But when the WBC told Whyte that he needed to fight Ortiz, he went in different direction and fought Lucas Browne and Joseph Parker. As you would guess, Whyte has failed to earn the WBC mandatory status and he’s wasted two years of his career fighting the wrong guys for him to get a title shot against Wilder. “Whenever you get two guys who don’t particularly like each other and [they] don’t want to give an inch in their negotiations,” Whyte’s promoter Eddie Hearn said to skysports.com. “There’s a lot of money to be made for each other in this fight, it’s a huge event but no-one really wants to give,” Hearn said about the Whyte vs. Chisora negotiations. The only guy that Hearn is talking about for Whyte is Chisora, not Ortiz. He’s not mentioning Ortiz’s name at all, and that tells you something. It doesn’t matter how often Wilder says that he’ll give Whyte a world title shot if he faces the 39-year-old Ortiz and beats him. Whyte simply doesn’t fancy the fight with the Cuban talent. Whyte wants two guys right now and that’s Chisora on December 22, and then Anthony Joshua on April 13. Whyte is fortunate enough to have both of those heavyweights in Hearn’s Matchroom Sport stable, which makes things a lot easier. Even if Whyte faces both Joshua and Chisora, he’s still not going to be chomping at the bit to face a knockout artist like Ortiz, because he’s someone that could take him out in a mean fashion. The likely scenario is Whyte will face Chisora on December 22 and beat him by another controversial decision. After that fight, Whyte will face Joshua next year on April 13, and get knocked out again by him. Whyte will then go on the journeyman circuit by facing scrubs to get boxing fans believing in him again. He’ll then start pushing Hearn for a third fight with Joshua and Chisora. In other words, it all starts again after Whyte faces Chisora and Joshua. There won’t be any fights against Ortiz and definitely not Wilder, who is simply too dangerous for him.